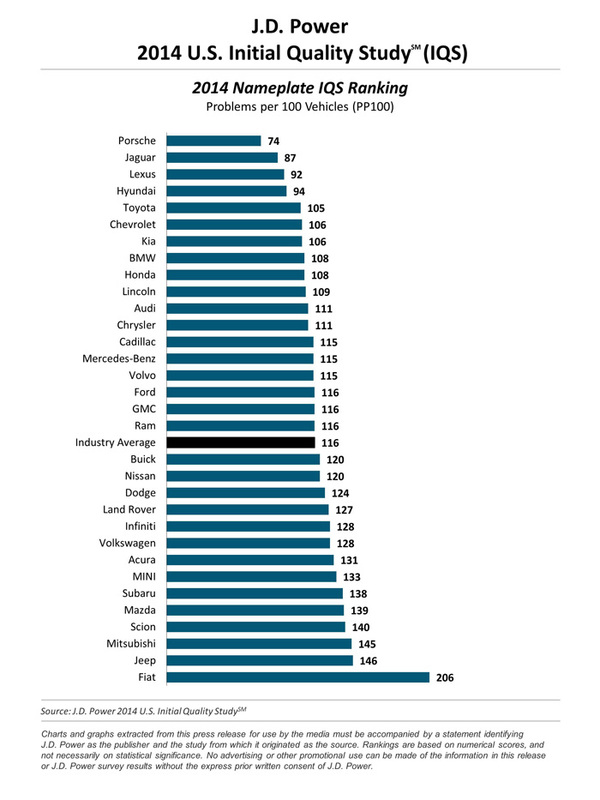 , they also release an Initial Quality Study (IQS) primarily based off of problems per 100 vehicles reported by new vehicle owners. As the study’s name indicates, this is an initial quality study finding overall initial issues when the vehicle is new. Porsche, Jaguar and Lexus top the list of this year’s IQS while GM vehicles topped six segments for highest ranking with Hyundai taking three top slots. An over-all 3 percent increase of problems is observed over 2013’s study. Hit up the full press release for detailed information and view the exclusive charts below for a full rundown of each manufacturer. WESTLAKE VILLAGE, Calif.: Wednesday, June 18, 2014 — The number of problems experienced by new-vehicle owners has increased from the previous year, as automakers continued to be challenged when introducing sophisticated technologies in new vehicles, according to the J.D. Power 2014 U.S. Initial Quality StudySM (IQS) released today. The study, now in its 28th year, examines problems experienced by vehicle owners during the first 90 days of ownership. Initial quality is determined by the number of problems experienced per 100 vehicles (PP100), with a lower score reflecting higher quality. The study finds that overall initial quality averages 116 PP100, a 3 percent increase in problems from 113 PP100 in 2013. This year’s increase in problems follows a similar increase found in the J.D. 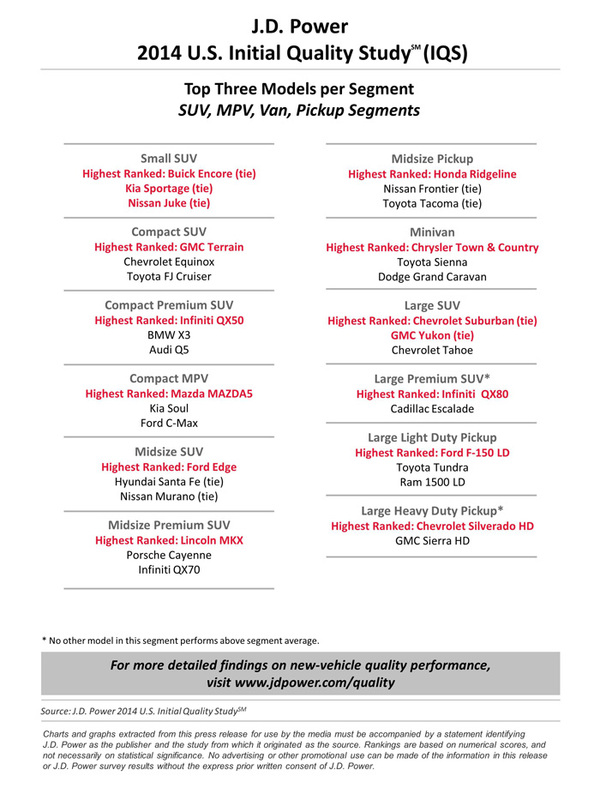 Power U.S. 2014 Vehicle Dependability StudySM (VDS) released in February, which measures problems experienced after three years of ownership. The study identifies two primary causes of the increased problem levels in 2014. First, newly launched vehicles (those that are completely new to the market or have undergone major redesigns) continue to be more problematic than carryover vehicles (those that did not undergo any significant changes). On average, newly launched vehicles experience 128 PP100, compared with 113 PP100 for carryover vehicles. The increase in problems among all-new vehicles is found mainly in the areas of voice recognition, Bluetooth pairing and audio systems. Some regions experienced increases in problem types associated with harsh weather. Consumers in the South and West regions of the country report the same level of problems as in 2013 (114 PP100). In contrast, consumers in the Northeast and Midwest regions report 117 PP100 in 2014, compared with 112 PP100 in 2013. Most of this increase is found in the heating/ventilation/air conditioning, exterior and engine/transmission categories, three areas in which harsh weather conditions have an adverse effect on vehicles. The study also finds that the fewer problems owners experience with their vehicle, the greater their loyalty to the brand. Combined data from previous years’ IQS results and the Power Information Network® (PIN) from J.D. Power show that 57 percent of owners who reported no problems stayed with the same brand when they purchased their next new vehicle. Brand loyalty slips to 53 percent among owners who reported just a single problem and to only 48 percent among owners who reported two or more problems. For a second consecutive year, Porsche ranks highest in initial quality among all nameplates, with a score of 74 PP100. Following Porsche in the rankings are Jaguar (87 PP100), Lexus (92 PP100) and Hyundai (94 PP100). General Motors Company receives six segment awards—more than any other automaker for a second consecutive year—for the Buick Encore (tie); Chevrolet Malibu; Chevrolet Silverado HD; Chevrolet Suburban (tie); GMC Terrain; and GMC Yukon (tie). Hyundai Motor Company receives five awards for the Hyundai Accent; Hyundai Elantra; Hyundai Genesis; Kia Cadenza; and Kia Sportage (tie). Other corporations with multiple award recipients are Ford Motor Company (Ford Edge, Ford F-150 LD and Lincoln MKX); Nissan Motor Company (Infiniti QX50, Infiniti QX80 and Nissan JUKE [tie]); Volkswagen AG (Porsche 911, Porsche Boxster and Porsche Panamera); Fiat Chrysler Automobiles (Chrysler Town & Country and Dodge Challenger); and Mazda (Mazda MAZDA5 and Mazda MX-5 Miata). Other models receiving awards are the Honda Ridgeline and Lexus ES. Toyota Motor Corporation’s Cambridge South, Ontario, Canada (TMMC) plant, which produces the Lexus RX, receives the Platinum Plant Quality Award for producing models that yield the fewest defects or malfunctions. Plant quality awards are based solely on defects and malfunctions and exclude design-related problems. 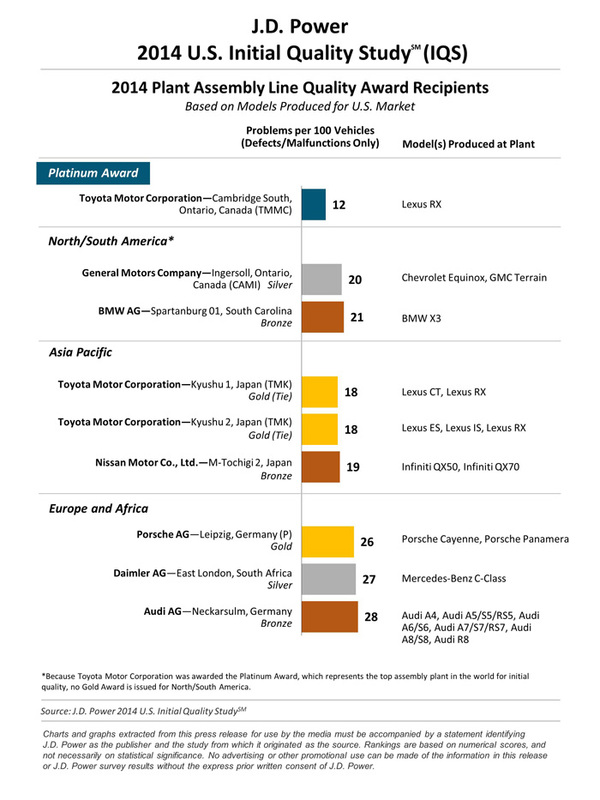 Two sister plants receive the Gold Plant Quality Award in the Asia Pacific region. Toyota Motor Corporation’s Kyushu 1, Japan (TMK) plant produces the Lexus CT and RX. Across the road, the same company’s Kyushu 2 plant produces the Lexus ES, IS and RX. In the Europe and Africa region, Porsche AG receives the Gold Plant Quality Award for its Leipzig, Germany (P), plant, which produces the Porsche Cayenne and Panamera. The 2014 U.S. Initial Quality Study is based on responses from more than 86,000 purchasers and lessees of new 2014 model-year vehicles surveyed after 90 days of ownership. The study is based on a 233-question battery designed to provide manufacturers with information to facilitate the identification of problems and drive product improvement. The study was fielded between February and May 2014. 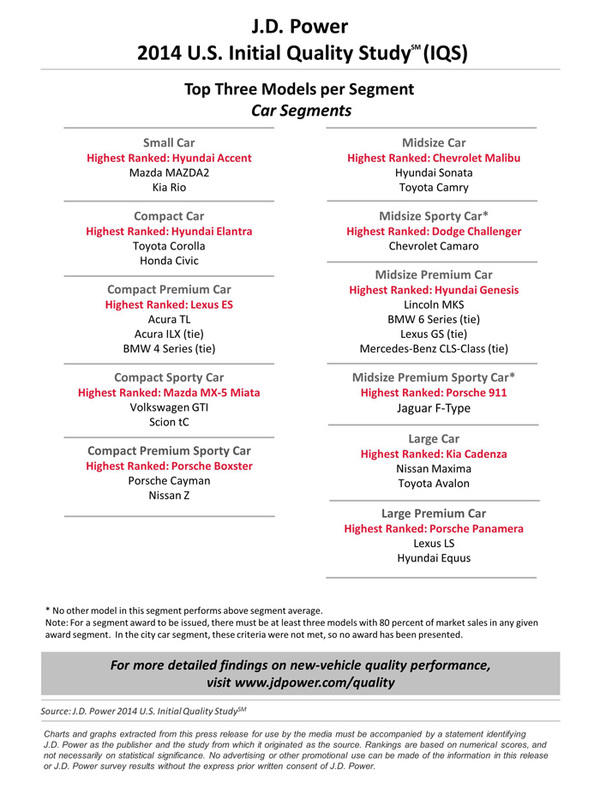 Find more detailed information on vehicle quality, as well as model photos and specs, atJDPower.com/quality.